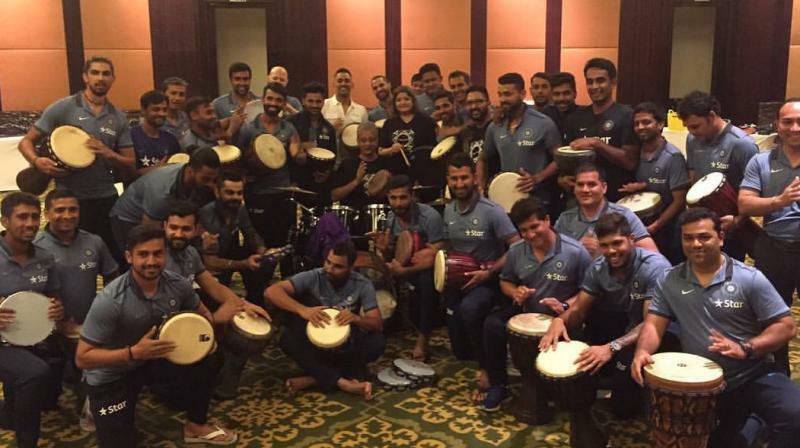 The members of the Indian team, including Dhoni, got involved in an entertaining drumming session with singer Vasundhara Das. Mumbai: In addition to the yoga sessions, the members of the Indian team, including ODI skipper Mahendra Singh Dhoni, got involved in an entertaining drumming session with singer Vasundhara Das to unwind themselves on the penultimate day of their preparatory camp in Bengaluru. Vasundhara said new Team India coach Anil Kumble was keen to understand the positives that the team, who are constantly under stress, would be able to take from such a session. "Having gone through the session, Anil asked his team captains to share their thoughts. MS Dhoni emphasised the fun that was had and the energy created during the Drumjam and spoke about how he wanted the team to carry the same energy and spirit onto the pitch," Das said. "Virat Kohli spoke about how this was not just about drumming, music or cricket, but about fundamental life lessons learnt during the session,” she added. “Kumble reached out to us and wanted to have a fun activity for the Indian team. We at ‘Drumjam’ were more than happy to facilitate a session for him,” said the singer. "This was definitely the first time for the Drumjam Team to be conducting a session for a professional sports body like the Indian Cricket Team," she signed off.